The wait is finally over! The 2015 Kansas high school football season is upon us and begins with the release of our Kpreps.com Top 5 rankings. Each new season brings new storylines and spurs debates over the teams we think too highly of or the teams we’ve just provided a season worth of bulletin board material. While we have confidence in our rankings team and the research we conduct, we’ll admit that this process doesn’t seem to get any easier each year. 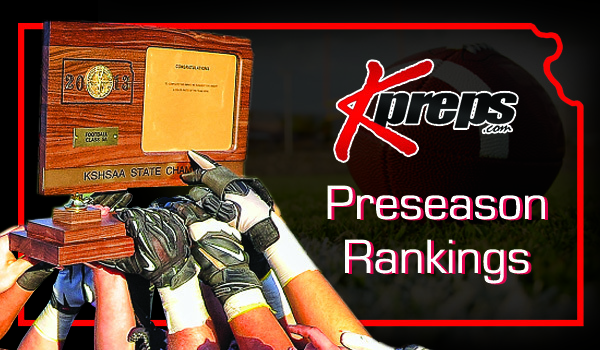 The annual disclaimer: our Kpreps rankings are a collaborative effort from multiple media sources across the state and will be released each Monday throughout the season. Now that’s out of the way, let’s take a look at the preseason rankings for each classification. Defending champion Shawnee Mission East opens the season as the top team in Class 6A. All Dustin Delaney has done in his two years with the Lancers is reach the 6A title game each year, and claim the school’s first state title. While the Lancers lost some key players to graduation, 13 returning starters should mean that Shawnee Mission East will be a factor again in 2015. Blue Valley opens as the No. 2 team in 6A after reaching the state quarterfinals a year ago. The Tigers return a lot of offensive firepower, including their entire backfield, and should challenge in their second year back in 6A. After winning the 2013 6A title, Derby returned only a few starters last season, but still turned out a 9-2 record and a state quarterfinal appearance. Now the No. 3 Panthers bring back 15 total starters and look to stay consistently among the 6A elite. Lawrence returns about as much talent as anyone in the state and opens the season ranked No. 4. The Chesty Lions feature one of the state’s top recruits in defensive lineman Amani Bledsoe as well as all-state selections in linebacker Price Morgan and running back J.D. Woods. In a close vote, Topeka High opens the season in the final spot in the 6A poll. Like Lawrence, the Trojans also return plenty of players sought after by coaches at the next level. Offensive lineman Teven Jenkins has verbally committed to Oklahoma State. Jenkins and three other returning linemen will be blocking for back 1,100-yard rusher Mike McCoy, while wideout Dante Brooks will continue stretch the field. Offense has not been the Trojans’ issue in the past, but if they are to make a deep playoff run, the defense will have to play more consistent against the upper echelon of 6A. It is probably no surprise that Bishop Carroll and St. Thomas Aquinas hold the top two spots in our preseason rankings, but maybe the order will surprise some. Aquinas opens the season in the top spot with 14 returning starters and a couple of seemingly key additions. Bishop Carroll returns only a handful of starters from their dominating championship team last fall, but plenty of underclassmen saw action as virtually all of the Golden Eagles’ games got out of hand a year ago. All-State lineman Noah Johnson and defensive standouts Chris Dugan and Will Honas headline the Carroll roster in 2015. Sam Sellers’ Salina South Cougars have become accustomed to being near the top of the 5A poll and this year is no different. The Cougars check in at No. 3 this year after reach the semifinals in 2014. The remainder of the 5A field starts to even out a bit more. Blue Valley West and Mill Valley round out the preseason poll at No. 4 and No. 5, respectively. Blue Valley West missed the playoffs a season ago, a rarity after posting a 2-1 district record. Mill Valley got through a brutal regular season schedule at 5-4, but fell to Pittsburg in the opening round of the playoffs. The Jaguars have not realized much postseason success in recent years, but hope that 17 returning starters will help change that trend in 2015. Perhaps no team was a dominant during the 2014 season than Bishop Miege. The Stags captured the 4A-I state title by holding off Topeka Hayden 42-35. Miege opens the poll at No. 1 again this season and with all-state running back Dawson Downing and receiver Jafar Armstrong, the offense will likely be explosive again. Buhler won the final 4A state title in 2013 and the Crusaders have the talent to reach the pinnacle of 4A-I again. Buhler opens at No. 2 and you can expect to hear the trio of Jace Williams, Dillon Engellund, and Jaden Abernathy talked about quite a bit this season. Last year’s state runner-up Topeka Hayden opens the poll at No. 3. The Wildcats return only four starters on each side of the ball, but have proven to be a program worthy of competing with the best in 4A. Ulysses checks in at No. 4 in the preseason poll. The Tigers have lost to Buhler in the first round of the playoffs in each of the past two seasons, but hope to change that trend in 2015. Ulysses will ride the legs of four-year starter Ian Rudzik who has amassed more than 5,200 rushing yards and 67 touchdowns in his career. Finally, Fort Scott is ranked No. 5 in the preseason poll. The Tigers return 11 starters from a team that finished 9-2 a year ago with losses to Miege and 5A playoff qualifier Pittsburg. In the second year of Class 4A-II, the preseason poll contains four of the same teams that opened in the poll last year. Andale is the unanimous No. 1 to open the season after running to the state title with a 13-0 season a year ago. The Indians must basically replace their entire backfield from a year ago, but depth and talent never seems to be much of an issue for Gary O’Hair’s program. The team Andale defeated to reach the title game a year ago, Holcomb, opens the poll at No. 2. Kent Teeter’s Longhorn’s return 18 starters from a 10-2 season that included an overtime win over Ulysses. Traditional power Holton is ranked third to open the season. The Wildcats reached the state quarterfinals before falling 22-21 to eventual 4A-II runner-up Columbus. Speaking of the Titans, they open at No. 4 this season and return plenty of talent from what was the best season in school history. All-state running back Jace McDown will try and lead the Titan offense back to the title game. Finally, the Frontenac Raiders win a close vote to open the poll at No. 5. Frontenac defeated Columbus in district play to win the CNC League championship, but fell at Santa Fe Trail 14-13 in the playoffs. The Raiders return five starters but plenty of other lettermen who made significant contributions a year ago. For the first time since 2009 and only the second time in the past 13 seasons, Silver Lake did not reach the Class 3A state title game. Instead, the Eagles fell to their arch rival Rossville 21-14 in the semifinals and Rossville went on the claim their schools’ first ever state football championship. Rossville opens the 3A poll this season at No. 1 and returns a ton of talent, including one of the state’s best in Tucker Horak. It was Horak who scored with less than 30 seconds remaining in the championship game to give the Dawgs a 21-14 win over Scott City. Scott City returns a strong nucleus as well and opens the poll at No. 2. Wichita Collegiate graduated only five seniors off of 2014’s state quarterfinal team and opens our poll at No. 3. The Spartans return a talented quarterback in Austin Waddell, but must replace speedy all-state running back Jaques Williams. Halstead was one of the state’s biggest surprised last season. The Dragons grabbed momentum in the playoffs and reached the state semifinals before falling to Scott City 20-14 in overtime. Halstead opens the 3A poll at No. 4 and returns the dynamic backfield of Blake Beckett and Eli McKee. Finally, you know a classification is loaded when a traditional power like Silver Lake is ranked No. 5. The Eagles return only a handful of starters from a year ago, but don’t expect Silver Lake to be in a rebuilding mode. In Class 2-1A, Meade opens the poll at No. 1 thanks to 15 returning starters. The Buffaloes are a perennial contender in the classification, and turned a rather inexperienced group in to an 8-win season and a playoff appearance a season ago. Phillipsburg is the No. 2 team after reaching the state semifinals before losing a heartbreaker, 22-21 to Ell-Saline. The Panthers fumbled on the 1-yard line with 17 seconds remaining in that semifinal loss, and at least 15 returning starters would like to erase that memory with a strong showing this season. Defending champion Olpe is ranked third to open the season. The Eagles captured the school’s first state football title a year ago, but graduated several talented players. Olpe is still talented at the skill positions and consistent play up front may be their key to success in 2015. A pair of Heart of America League foes Sedgwick and Marion round out the top five at No. 4 and No. 5, respectively. The Cardinals and Warriors hope to capture the momentum that fellow league member Ell-Saline caught last season on their run to the 2-1A title game. Central Plains captured the 8M-I state championship in 2014 with a 42-30 win over Hanover. The Oilers return seven starters on offense and six on defense from that team and open the season at No. 1. Ranked second is a team Central Plains narrowly defeated in the playoffs. Spearville led Central Plains for all of one play in their quarterfinal showdown before the Oilers regained the lead. Central Plains went on to win 42-40. Spearville returns just as much talent this season and the Royal Lancers and Oilers may be on a collision course for another playoff showdown. Wakefield opens the season at No. 3 after missing the playoffs completely in 2014. The Bombers finished 7-2 in one of the state’s most competitive districts in all classifications. Wakefield’s losses came to Hanover and by two points in overtime to Osborne. This season, the Bombers return seven starters on offense and six on defense including Zack Melius who scored a record 11 touchdowns in a game last season. Udall checks in the poll at No. 4 this season. The Eagles return 10 total starters from a 10-1 team that reached the quarterfinals before losing to Hanover. This past summer, Steve Tiernan announced he was leaving Osborne to take the coaching job at Solomon. That meant his son Jake, an all-state quarterback, was going to follow. Solomon already had an excellent quarterback in Cain Fowles, but Jake brings a career completion percentage of 72% and nearly 5,000 career passing yards with 79 touchdowns. The addition of the Tiernans with seven other returning starters could spell a big turnaround for the Gorillas. Another unanimous choice for No. 1 comes in 8M-II where defending champion Victoria seems poised for a repeat. The Knights return 12 total starters including quarterback Brady Dinkel and their entire line. The Knights open the season at home against 8M-I No. 1 Central Plains. If any team is able to take the Division II title from Victoria it may be Sharon Springs-Wallace County. The Wildcats lost 28-12 to Victoria in the semifinals a season ago, but return three all-state players on defense. Ingalls checks in at No. 3 in the preseason poll after winning its first 10 games in 2014 before a quarterfinal loss to Sharon Springs-Wallace County. The Bulldogs have 13 total starters back including a lot of speed in the backfield in all-stater Josh Irsik. Last year’s state runner-up Argonia-Attica returns one of the state’s best players in quarterback Alec McDaniel. McDaniel is the type of player that can carry a team a long way and last year proved it in accumulating more than 3,200 yards of total offense and a combined 68 touchdowns. Finally, Axtell rounds out the Division II poll at No. 5. The Eagles reached the state semifinals last fall after upsetting No.1 Chetopa. Back among four starters is all-state quarterback Colton Buessing after he passed for more than 2,000 yards and 26 touchdowns in 2014.